I tucked this one back when I got it waiting for the right moment. I’m working on a new WIP (Work In Progress) and getting to know the characters. A good writer knows the goals, motivation and conflict of each major character and how that applies to the plot and story line. The Universe nailed it when it comes to making characters “real.” They need fears, pain, and understanding what makes them tick, allows you to give them hope and their HEA (Happy Ever After). Sometimes, understanding their fears, Silver, helps you to understand their actions and their pain. Plus, understanding their fears sometimes helps you to understand your own. You know, Silver, “birds of a feather,” “no coincidences,” “like attracts like,” and all that jazz. There really is something to all those clichés. And sometimes, when you write and tell your character’s story, you gain some insight into your own. Been there, done that. (Speaking of clichés.) I have the best job in the world. And coffee. Don’t forget the coffee. What’s your favorite cliché? This entry was posted in Writing Life and tagged coffee, inspiration, musing, quotes, Thursday Thoughts, Universe, WIPs, writing. Bookmark the permalink. I’m full of cliches, which I really have to watch when I’m writing. But I can’t think of a favorite one this morning. This morning I’m lucky I can think of my own name. Coffee. I’ll admit to occasionally inserting cliches for the fun of it or to make a point in the story. 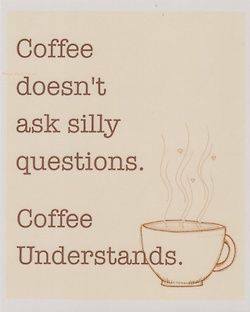 And yeah, I second the motion for coffee!